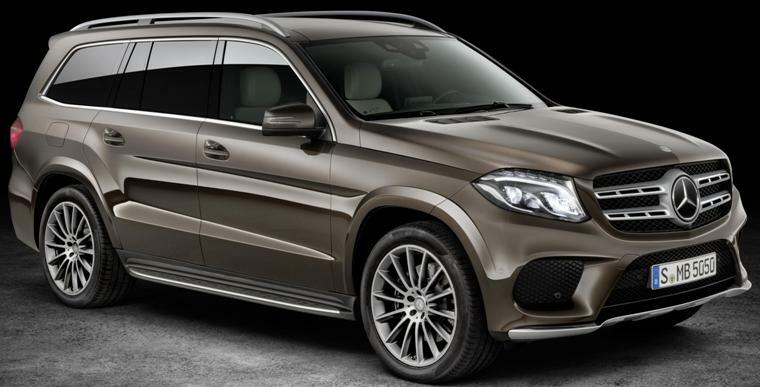 The new 2017 Mercedes-Benz GLS seven passenger SUV is powered by a 362 horsepower 3.0-liter V6 bi-turbo engine in the GLS450 4MATIC, a 449 horsepower V8 bi-turbo engine in the GLS550 4MATIC, and a 577 horsepower powerplant in the Mercedes-AMG GLS63. The GLS350d 4MATIC offers 255 horsepower V6 diesel engine. All versions mated to the nine-speed 9G-TRONIC automatic transmission as standard, except the Mercedes-AMG GLS63 which gets the revised AMG SPEEDSHIFT PLUS 7G-TRONIC transmission. With DYNAMIC SELECT, the new GLS provides COMFORT, SLIPPERY and SPORT transmission modes, in addition to INDIVIDUAL or an OFF-ROAD mode. Standard driver assistance systems include COLLISION PREVENTION ASSIST PLUS, Crosswind Assist and ATTENTION ASSIST. Other systems available as standard on the GLS include: PRE-SAFE® system, Brake Assist BAS, electronic all- wheel drive traction system 4ETS, ESP®, and cruise control. The optional Driver Assistance Package has systems including DISTRONIC PLUS with Steering Assist, PRE-SAFE® Brake with pedestrian detection, BAS PLUS with Cross-Traffic Assist, Active Blind Spot Assist, Active Lane Keeping Assist and Speed Limit Assist. The GLS will be available to order from December, with deliveries in in the US market from late-March 2016.